Meet Diana Holl, a traveling yogini and true global soul who has spent the last ten years working as a flight attendant. In the past three years, Diana’s shared her love and passion for yoga, teaching at Yoga-On-Call in Ghent, Belgium when she’s not traveling for work or backpacking around the world with her husband. I connected with Diana a few years ago during a one-month yoga teacher training in Brazil and we’ve been like family every since. 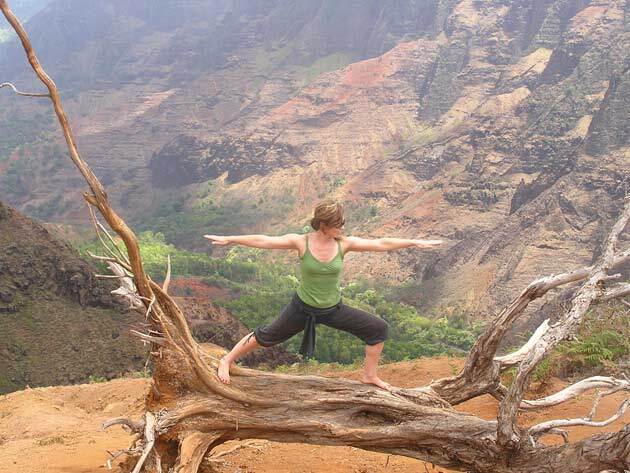 Her dedication to yoga and love of travel inspires this Q&A, which will be an on-going series in Journeys to Bliss. Why do you travel? What's the yoga in your travel? I’m attracted to the sense of adventure that travel gives me. Moving from Hungary to Belgium as a child during the time of the Iron Curtain might have ignited that feeling of adventure. I love discovering new places that are off the beaten track. Being pulled out of my usual and 'safe' environment teaches me much about myself and adds a sense of relativity to my daily existence. And there is the comparison with yoga: the practice of yoga on your mat is quite "easy", the real challenge lies in the moment when you step off your mat and interact with people, with nature, with the world around you. On the job, I always take my yoga mat with me so that I can practice in my hotel room, or outside under the shade of a tree, which I find to be very grounding. Sometimes my colleagues would get curious and join in. As a flight attendant, how do you find time to practice and teach yoga? For the past five years, I've been flying only part-time in order to have time and space for my yoga practice. I get my inspiration from the time off, taking yoga workshops around the world with amazing teachers and meeting new friends. Yoga forms a strong common bond between people, no matter what language you speak. What are your favorite yoga destinations? 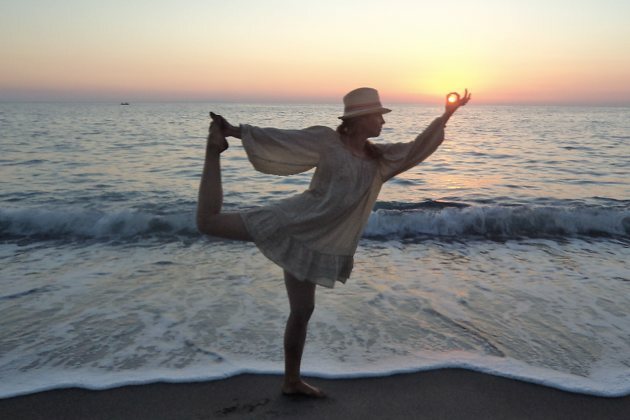 Some of my favorite yoga destinations are Bali, San Francisco and Crete. With Bali, give it time to fully soak in the true atmosphere. Ubud at first seemed to me like a busy little city with lots of traffic. But stay longer and you’ll tune in to the island’s deep calm energy. There are so many yoga classes on Bali, especially in Ubud, where you can create your own little retreat. I stayed with my husband in a private bamboo house in a small village outside of Ubud overlooking a valley of idyllic rice paddies. Every morning at sunrise I’d drive my scooter through the rice paddies and witness the morning rituals on my way to the yoga studio. What really touched me is the devotion of the Balinese, not only to the gods and goddesses but also to their every day activities. Offerings of gratitude are made several times a day and the Balinese are more than willing to share their daily life with you. Being invited to have tea in their homes, while the families prepared for a big festivity, was a heart-opening experience. San Francisco is a city where you find diversity on so many levels. There is top-notch yoga, amazing food, great people and the ocean nearby in case you need to escape the city. I've done a couple of teacher trainings in the city and every year I like to return to practice as much as I can in different studios. One of my favorite studios, Urban Flow, feels much like home with its strong sense of community. Rusty Wells' classes are so joyful, and the chanting just makes me happy. Living in Belgium and traveling often to dream yoga destinations that are at least ten hours away by plane, I never imagined finding a gem as Crete in Greece to be so nearby. I recently took a level II Teacher Training in the southern part of the island at Yoga Rocks, Triopetra. The drive across the island from the airport in the north to the south side of the island is simply stunning. Triopetra feels like the "end of the world", where there are no cars, no noise, and no crowds except for sheep. You can hear the sound of the ocean from the outdoor yoga shala overlooking the sea. The deserted beach goes on and on, you can feel the softness of the water, and the light of the setting sun over the sea is so breathtaking that you can’t help but feel like one with nature. One of the most magical moments that week was our little campfire on the beach and a night swim with fluorescence particles in the water, which lit up when they came in contact with your body! It was bliss!